In the life of a Hindu Upanayana marks the beginning of Brahmacharya Ashrama which is set apart for the study of Vedas; this stage is said to be the second birth for him. Mere wearing of a sacred thread initiated on the Upanayana day does not make him a real Brahmacharin. It is rather the study of Vedas, learning and chanting Vedic mantras including Gayathri and Sandhya vandana which will qualify him to be a true Brahmachari means a student who is eligable to study the Bramha vidya. The Achamanam must be performed facing the east or north. It should not be done facing the west or south. Leaving out the thumb and the forefinger, the other three fingers must be bent a little and then a small space for keeping is found in the inner hand. Water should be poured there and sipped thrice uttering the three mantras in succession. Then the hand should be washed twice. If there is pavitrain the second finger, it should be removed at the time of Achamana and worn again after Achamana. As the thumb and the mouth are the seats of fire,, the name ( Kesava) and(Narayana) are uttered with the thumb touching the right and left cheeksrespectively. The second finger and the eyes are regarded as the seats of the sun and so with the second finger the right andleft eyes are touched, repeating the names (Madhava) and (Govinda). The forefinger and the nose, being considered as seats of Vayu (Wind) the right and left parts of the nose are touched by the forefinger with the names (Vishnu) and(Madhusoodana) being repeated respectively. The little finger and the ears are seats of Indra and hence by the little finger the right and left ears are touched uttering the names (Trivikrama) and(Vamana) respectively. Hrishikesa respectively. The inner part of the hand and the heart being considered as the seats of Paramatma the inner hand should touch the heart and top of the head, uttering the names Padmanabha and Damodara in succession. The two hands should be folded and the two sides of the forehead struck gently five times, repeating the above mantra, with the meditation of Ganapati and imagining that the nectar collected in the head according to the Yogasastras is entering into each nerve. Dhyayet – should be meditated. The All-pervading, clad in white garment, resplendent like the Moon, the four-armed and the cheerful – faced Lord should be meditated to ward off all obstacles. Next comes Pranayama, i. e. Control of Prana. Om Bhuh / Om Bhuvah / Om Suvaha / Om Mahah / Om Janah / Om Tapah / Om Satyam / Om Tat Saviturvarenyam Bhargo Devasya Dhimahi / Dhiyo yo Nah Prachodayat / Om Apo Jyoti-rasomritam Brahma Bhurbhuvassuvarom. The forefinger and the middle finger should be bent and by the thumb and second finger, the nose must be touched, on either side, the right nostril should be closed and air must be taken slowly by the left nostril and then that should be closed and after a time the air slowly sent out by the right nostril. The inhaling is calledPuraka, the retaining Kumbhaka and the exhaling Rechaka. The proportion of time of these three viz. Puraka, Kumbhaka and Rechaka should be in the ratio 1: 3: 2. The Puraka, Kumbhaka and Rechaka ‘all three together, make one Pranayama. FromOm Bhuh upto Dhiyo yo nab prachodayatwould be Puraka. From Omapo Jyoti-rasomritam Brahma Bhurbhuvassuvarom uptoOm Bhuh, Om Bhuvah will be one Kumbhaka.The third turn from Om Bhuh upto the end will be Rechaka. 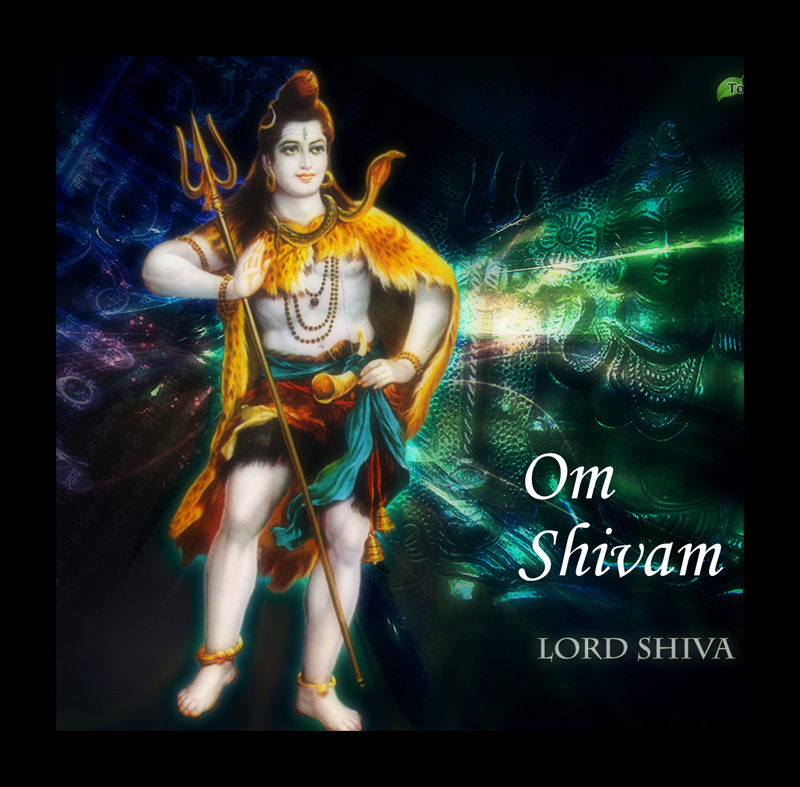 Bhurbhuvassuvarom – The mind, the intellect and the egoism is also that Om. The Seven worlds beginning with this universe Bhuh are verily the Omkar. He, the Supreme Lord, inspires our intellects. We meditate on the light of the creator of the Worlds. Water, light, this world, air and the sky as well as the mind, the intellect and the egoism are also that Om. Sankalpah: Mamopatta-Samasta Duritakshaya-dwara-Sri–Parameswara – preetyartham Pratah Sandhyamupasishye. The Sankalpa should be made after Pranayama and then alone any work should be begun. When the Mantra is recited, the left hand should be below the right hand and both hands clasped and placed on the thigh. Upasishye -I begin to worship. I worship the Sandhya Goddess of the morning to be worthy of the Grace of the Supreme Lord by the destruction of all sins that have accumulated in me in previous births. Apohishta mayo bhuvah / ta na oorje dadhatana maheranaya chakshase / yo vah sivatamorasah / Tasya bhajayateha nah / Usateeriya Matarah / Tasma arangamama vah yasya kshayayajinvatha / Apo janayatha cha nah / Om Bhurbhuvos suvah. With the second finger of the right hand write the letter Om on Water and uttering the word Sri kesavaya namah touch the centre of the brows with that very finger. With the first seven mantras sprinkle water on the head with the second finger. Reciting the eighth Mantra touch ,the feet with the second finger. Reciting the ninth mantra sprinkle water again on the head. 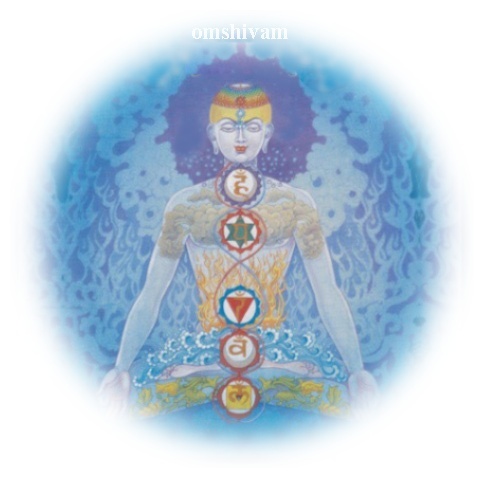 Then repeating the mantra – Om Bhurbhuvassuvah make a circuit of your head. Janayatha -making us pure by knowledge, live us rebirth. 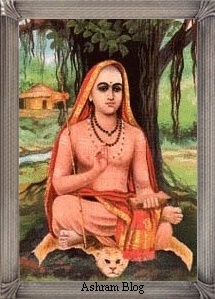 Om-Namskar to Sri Kesava. You water Goddesses are the causes of conferring the highest happiness. Even such are you. Give us nourishment for the eye of knowledge, which is so great and beautiful. The most auspicious Bliss that is in you, be like loving mothers to give us that Supreme Bliss. You are love personified and the seat of that Bliss. We pray you with great earnestness to give us that Bliss. Make us pure by knowledge and be reborn as it were resplendently. Reciting this mantra, take water in your right hand. measuring a full sized hollow of the palm and drink it. Save me from the sins born of anger, O Lord! The Sun, anger and Anger God, what has been done at night by the mind, speech, the two hands, two feet, the stomach and sexual organ as well as all other sins attaching to me may be removed. This I freed from all sins offer oblations to the Supreme Lord, the Supreme Light in the form of the Sun so that I may be worthy of moksha. Apah punantu prithivim prithivi puta punatu mam / punantu Brahmanaspatirbrahma puta punatu mam / yaduchhishtam abhojyam yadva duscharitam mama / Sarvam punantu ma maposatam cha pratigrahagg swaha. This is to be recited at noon and water sipped afterward. May the Goddess of water purify the earth. May that purified earth purify me and the teacher of Vedas. May the ever-purified Vedas purify me. The remnant of another’s food or uneatable food which I have eaten and my bad conduct oand the gifts I have received from bad people, may I be purified from all that. I offer myself to be consumed at the blaze of the Supreme Being. hastabhyam / Padbhyam Udarena Sishna / Ahasta-davalumpatu / Yat kincha durilam mayi / Idamaham mamritayonau Satye jyotishi juhomi swaha. This is to be recited in the evening and water sipped. May the Lord of Fire, anger, and God of anger protect me from all the sins committed by anger. May that sin done by me during the course of the day by the mind, word, the two hands, the two feet, the stomach and the private parts of the body be removed by the deity of the day. Thus purified I offer myself as an oblation to the resplendent Supreme light, the cause of Moksha. Apo hi shta myo bhuvah / Ta na oorjhe dadhatana / Maheranaya chakshase / Yo vah sivatamo rasah / Tasya bhajhayateha nah / Usatiriva Matarah / Tasma arangamama vah Yasya kshayaya jinvatha / Apo janayatha, cha nah / O Bhurbhuvassuvah. May the Lord, the supporter, the Ruler and the Measurer of all the worlds, the Victorious, the Seat of all knowledge Who has taken the form of hayagriva, the Swift Supreme Lord, whom I salute, make our senses do good. May our lives are without any hindrance. With this mantra, before sunrise take water filling both hands and pour thrice to the East. At noon, you must stand facing north and pour water twice. At night before sunset in a sitting posture, the thumb should be apart when offering the arghya. Then Pranayama should be done and then the Prayaschittarghya must be poured afterwards uttering, Om bhurbhuvassuvah. Circumambulate the head with water. With the two hands touch the chest close the eyes and deeply meditate on the truth that the Jeevatman and Paramatman are one. Sitting facing the East in the morning and noon and facing the North in the evening, we should pour water. It should not be poured as a current. From Kesava upto Damodara, the twelve names of lord Vishnu are the tutelary deities of the twelve months of the year beginning with Dhanus. Then with theAchamanam the preliminary part of Sandhya Vandanam is over. Now comes the second part, beginning with the Japa-Sankalpa. Mamopatta – samasta – duritakshayadwara Sriparameswara preetyartham Pratah Sandhya – Gayatri – Mahamantra-japam karishye/ . This should be done sitting on a seat with the eyes half closed and not seeing anything external. The water vessel must be placed in front, facing the East in the morning, and North at noon and the West in the evening. Gayatri – Maha – Mantra – Japam karishye – I shall do the japa of the great mantra Gayatri. When naming the rishi, the head, when naming the chhandas, the mouth and when naming the devata the breast should be touched by the right hand. As described before, one Pranayama needs the japam of the mantra thrice, at least three pranayamamust be done. Those who are not able to practise Puraka, Kumbhakas and Rechaka, should repeat the mantra ten times. Reciting this mantra, the Gayatri Devi should, be thought of as manifesting in the lotus of the heart. With the sign of invocation, the hands should be turned inwards in front of the heart. Savitriya Rishirvishivamitrah / Nichrudgayatri Chhandah/ Savita Devata //. 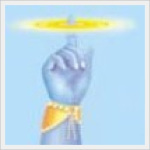 Rishirvishwamitrah – Vishwamitra is the Rishi. Nichrugayatri Chhandah –The Nichrud Gayatri is the metre. After the japam of Gayatri, the prayer to that deity to go to her own place is called Gayatri Upasthanam. First of all the Pranayama must be done. Chitrasravastamam – Excelling in attracting the minds of heavens. Satyaaya Ghrita vad – To get permanent results. Payaswaan – With the full effect of dharma. I meditate on the fame and greatness of that excellent attracted of the minds of heavens which never perishes, who worship the Sun God who protects all subjects. sin from near or far will not torment him. The Sun God who sees by the light of the soul and by the light of eyes the Gods and mortals and engaging them in their respective works, goes round in the golden chariot and travels with. a particular eye looking at the world. May we attain the excellent light of the Soul, we who see the Sun God who has a high form of light and rises swallowing darkness and the protector of even the Gods. That famous, all knowing Sun God is borne by the rays, his horses. 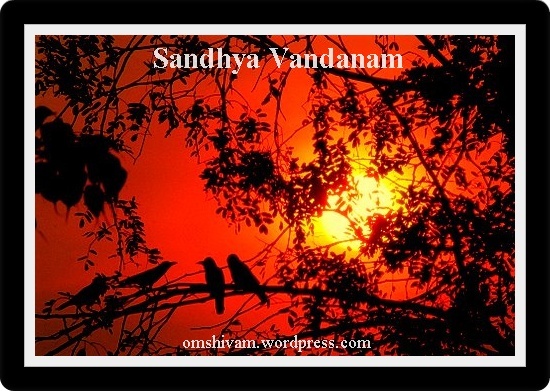 Devanaam Chitram Aneekam – The Sun ho is the form of Gods. Devahitam Chakshuh – Like an eye doing good to the Gods. Tat – That Solar Orb. Saradassatam – A hundred years. Jeevema saradassatam – May we live thus a hundred years. Nandaama Saradassatam – May we rejoice with our people a hundred years. Modaama Saradassatam – May we be joyous for a hundred years. Bhavaama Saradassatam – May we shine with fame for a hundred years. Srunavaama Saradassatam – May we hear pleasant things for a hundred years. 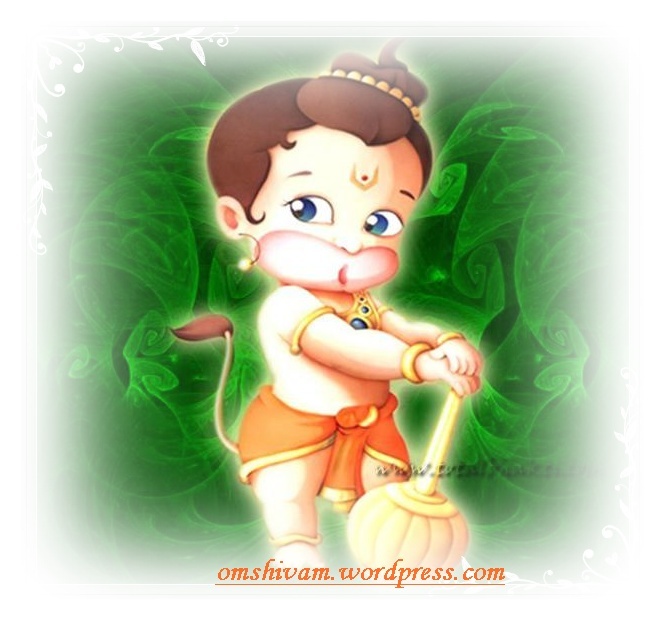 Prabravaama – May we speak good things for a hundred years. Ajeetah Syama Saradassatam – May we be not overcome by bad defeat for a hundred years. jyok cha – Thus for a long time. May the Sun who is an eye to Mitra, Varuna and Agni, the embodiment of various Gods, rise high? The Sun God, the Soul of moving and unmoving pervades the earth, the heaven and the atmosphere. May we see and bow for hundred years. That Sun who does good like the eye to the Gods, the pure light that rises in the east. Let us mix in joy for a hundred years with our own people. May we be happy for a hundred years. May we be bright with good fame for a hundred years. May we hear pleasant things for a hundred years. May we speak good things for a hundred years. 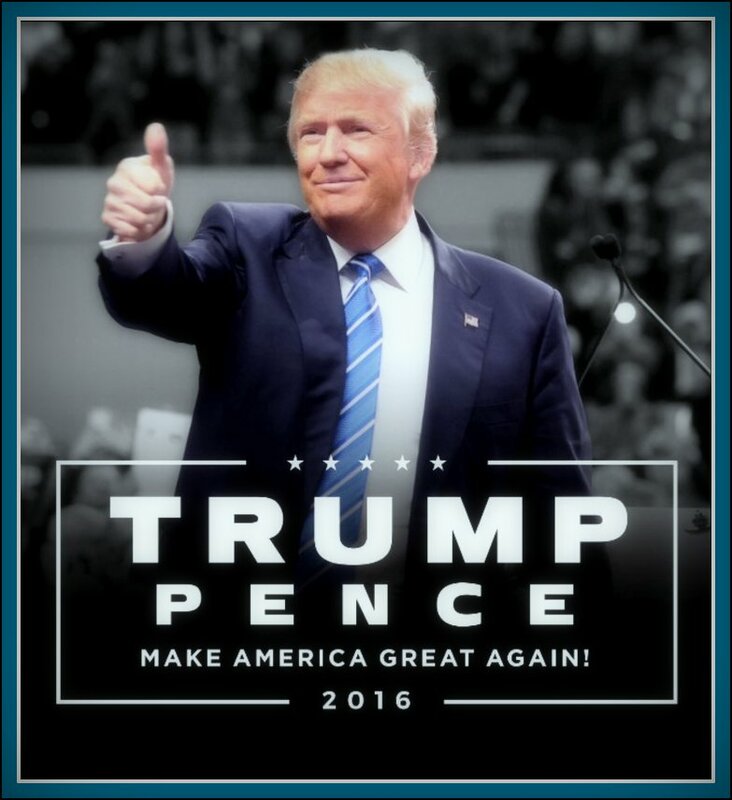 May we not be Soiled by bad defeat for a hundred years. May we see the Sun God for such a long time. May the fulfiller or desired results, the red-eyed, all knowing, shining everywhere, rising from the midst of the water. may that Sun God purify me with all my mind. Imam me Varuna srudhee havamadyaa cha mridaya / Tvaamavasyuraachake // Tatvaa yaami brahmanaa vandamaanasta daasaaste yajamaano havirbhih / Ahedamaano Varuneha Bodhyurusagumsa maa na Aayuh pramosheeh // yatchiddhi te visho yathaa pradeva Varuna Vratam / Mineemasi dyavidyavi // Yat kinchedam Varuna daivye janebhidroham manushyaascharaamasi / Achittee yattava dharmaa yuyopima maa nastasmaadenaso Deva reerishah // kitavaaso yadriripurna deevi yadvaa ghaa satyamuta yanna vidma / sarma taa vishya shithireva devaatha te syaama Varuna priyaasah . O God Varuna! Hear my prayer. Be gracious even now. 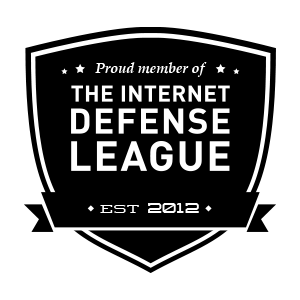 I pray to you seeking protection. 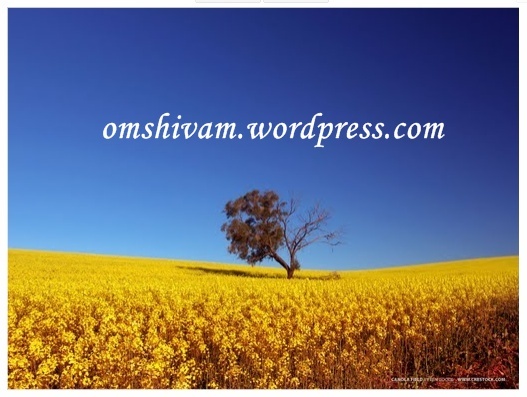 Maa pramosheeh – Do not lessens. Maa reerishah – Be gracious withoutpunishing us. O God Varuna! Like the undiscriminating people thy regular daily worship might have been omitted by negligence. O God Varuna! Such deceit might have been done unconsciously. All that we have done, thy dharmas which we have spoiled, 0 God Varuna! Save us by not punishing us for that sin. Syaama – May we always become. The blame attributed to me unjustly like the players of dice or the sin which I might have done knowingly and also those which I have done unknowingly, all these may be scattered and destroyed. O God Varuna! May we after wards always become beloved of you. After Japam the mantras Sandyaayai namahetc. should be uttered folding the hands beginning with the quarter, which one faces at the time of the japam. Finally looking to that very quarter Sarvaabhyo Devataabhyo namah and kamokaarsh- eenmanyurakaarsheennamo namah should be uttered with folded hands. Sarvaabhyo Devetaabhyo namo namah – To all deities. Kaamah akaarsheet – Kama (desire) did it. Manyuh akarsheet – The anger did it, i.e. I did not of my own will commit sins. Falling under the control of desire and anger, I did bad things unknowingly. Forgive me. Namo Namah -O Gods! I again and again salute you. Beginning from the quarter facing which the japa was done, the four quarters are saluted as well as the upper side and lower side and the middle portion and the Gods or the quarters, and afterwards the earth and the three Gods Brahma, Vishnu and, Siva. Udeechyai Dise Namah – Salutations to Gods of the northern side. 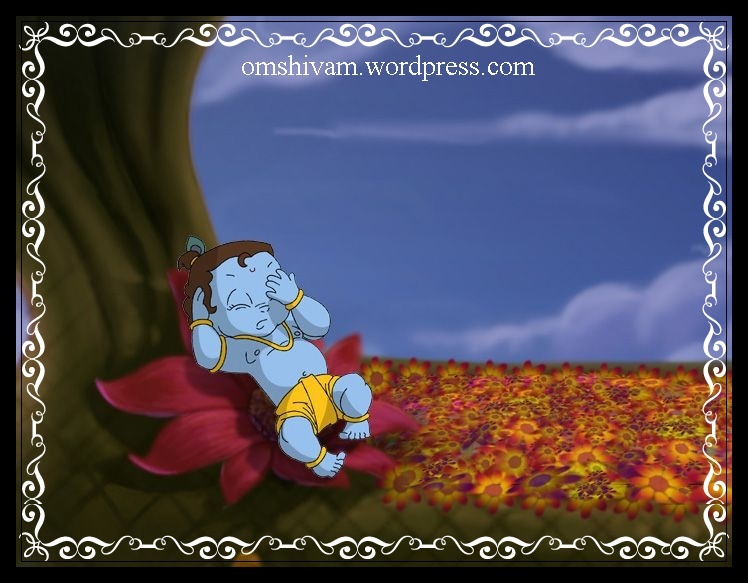 Oordhwaya Namah – Prostrations to the Gods of upper world. Adharaaya Namah – Salutations to the Gods of lower worlds. Antarikshaaya Namah – Salutations to Gods of middle world. Bhoomyai Namah – Salutations to the Goddess Earth. Brahmane Namah – Salutations to Brahma. Vishnave Namah – Salutations to Vishnu. Mrityaye Namah – Salutations to Rudra. mid-world. Salutations to Earth. Salutations to Brahma, Vishnu and Rudra. This mantra should be uttered facing the South. Yamaaya Namah – Salutations to Yama. Yamaaya – One who controls all. Dharmaraajaya – The God Dharma. Antakaaya cha – And the God who makes an end. Oudumbaraaya – The very strong. Neelaaya – Of blue colour. Parameshtine – Worshipped by all. Vrikodaraaya – Having a big belly. Chitraguptaaya Namah – Salutations to Yamadharma raja who keeps his wonderful secrets. Chitraguptaaya Vai Namah Om Nama Iti – Again salutations to Chitragupta Om Salutations. to that Chitragupta. Salutations to Om. Facing the north and standing with folded hands this mantra should be uttered. Satyam -The basis of sight. Purusham -Dwelling in all bodies. Oordhwaretam -Whose strength is upwards. Viswaroopaaya Vai -To that who is the form of the Universe or who assumes all forms. Viswaroopaya Vai Namo Nama Om Nama Iti –Salutations to Him who assumes all forms. Om Salutations. Vishnu and the red Shiva in one, the pure One and the three-eyed One. Salutations to Him who assumes all forms. OmSalutations. This mantra should be uttered facing the quarter in which, the japa was done, meditating on the Supreme self who has taken the forms of three deities, and prostrating. prasooti-sthiti -naasahetave -The cause of Creation, maintenance and destruction of the universe. Trayee mayaaya -The embodiment of the Vedas. Trigunaatma Dhaarine Virinchi Narayana Sankaraatmane – The three gunas taking the three forms as Brahma, Vishnu and Siva. Savitre – To the Sun God. Salutations to the Sun God, the Eye of the Universe, the Cause of Creation, Maintenance and Destruction of the Universe, the three Gunas, taking form asBrahma, Vishnu and Shiva. Savitrumandala-Madhyavartee -He who lives in the centre of the solar orb. Keyuravaan Makara Kundalavaan Kireetee Haaree – Who has the bracelets, the big ear-rings in the ear, the crown on the head and the pearl garland dangling on the chest. Keyuravaan Makara Kundalavaan Kireetee Haaree – Who has the bracelets, the big ear-rings in the ear, the crown on the head and the pearl garland dangling on the chest. He holds the Conch and Discus and is golden-hued in body. Dwaarkaa – Dweller of Dwaraka. Nilaya Achyuta – He who does not lose a particle of his nature. Govinda – Protector of the Earth. O holder of the Conch, Discus and Gada, the constant dweller in Dwaraka, the indestructible, the protector of the earth, the lotus eyed, save me who has taken refuge in Thee. Gacchati-yathaa – Just as it goes. Sarvadeva namaskaarah -Salutations to all Gods. Kesawam prati gacchati -Goes to Kesava. Om Nama iti – Salutation Om. Just as the waters from the sky go to the Ocean, so salutations to any God reaches Kesava. Om Nama. Kaayena Vaacha Manasendriyairvaa Budhyaatmana Vaa Prakriteh Swabhaavaat // Karomi Yadyat Sakalam Parasmai Naraayanaayeti samarpayaami //. Prakriteh swabhaavaat -Or by the character of one’s nature. I dedicate to Narayana, the Supreme God, whatever I have done by the body, speech, mind, and the senses or by the character of nature.